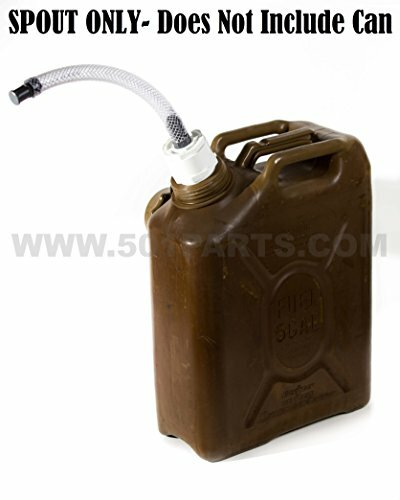 -This product is a PVC fuel spout for Military fuel/Jerry cans. -This 3/4 Inch hose design is used for gasoline vehicles and any other gasoline or diesel outdoor or powersport equipment. -The spout length is 12". -Multi Fuel- Will safely pour diesel, gasoline, kerosene and more. Please note that Scepter fuel cans have an internal fuel vent. If the fuel can is over-filled or tipped too far up when full, fuel will spill out of the vent hole. When pouring fuel, be careful not to overfill your fuel can or tip it upside down when full. If you have any questions, please don't hesitate to ask. Your satisfaction is our #1 goal. We are proud to be a Veteran owned small business. You can reach us at 501-658-0219. Proudly Hand Made and Assembled in the U.S.A. If you have any questions about this product by 501 Parts, contact us by completing and submitting the form below. If you are looking for a specif part number, please include it with your message.